Yeah, the “dislike” button is finally here – but it does not like this! The long-awaited Facebook “dislike” button is finally here, but presumably it looks a little bit different than you might have expected it to look like. Probably you cannot even call it a real “dislike” button but more an “empathy” button. To be more concrete, it is a strip of six new emojis that appear when you press the common “like” button. The new pop-up feature allows you to respond quickly to posts with love, laughter, happiness, shock, sadness or anger (see figure 1) (Lunden 2015). In September, CEO Mark Zuckerberg already caused excitement with Facebook-fans when he introduced that Facebook is working on an expanded “like” button during a question & answer session in California. He finally gave in to the pressure users were putting on him (Pachal 2015). 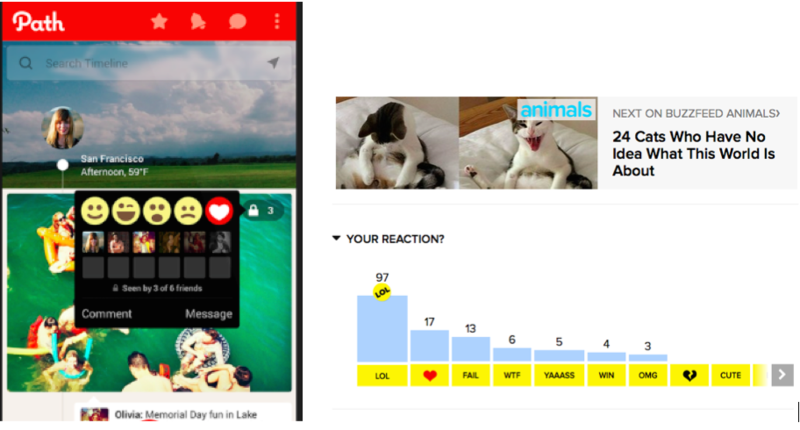 And it was high time to take action for Facebook since many other platforms like Path and Buzzfeed (see figure 2) already allow their users to express more than only one feeling. Eventually, on October 8th Chris Cox, chief product officer at Facebook posted on his wall that Facebook is launching a “pilot test of Reactions – a more expressive Like button” (Cox 2015). As he explains further, Facebook has decided to go against the much-fabled “dislike” button, hoping the new set of reactions addresses the spirit of the request more broadly (Cox 2015). The testing-phase started on 9th of October in Spain and Ireland (Cox 2015). Users have been demanding Mark Zuckerberg and his team for a long time to add a “dislike” button in order to be able to express more feelings than just liking something (Pachal 2015). Especially with dramatically sad or serious content there is no possibility to express empathy. Many users hesitate to “like” these types of posts, which is problematic since the Facebook newsfeed is algorithmically driven to focus on posts with the most engagement – especially likes (Pachal 2015). This is why it is even more important to give “unlikable” content the opportunity to become more attention. One could argue that there is already a good way to express empathy – the comment function. Unfortunately quite some effort is needed to type a comment, especially on mobile devices (Lunden 2015). But at the same time the amount of people being online on Facebook with their smartphones increases steadily. In June 2015 the company reported that it had over 840 million users accessing the site daily on mobile devices (Facebook Newsroom 2015). Although Facebook follows user’s wishes on the one hand and claims to make the internet more social, it has also turned into a “like economy” where “the social is of particular economic value, as user interactions are instantly transformed into comparable forms of data and presented to other users in a way that generates more traffic and engagement” (Gerlitz and Helmond 2013). More emotions and less effort for expressing different feelings could therefore lead to more traffic and more engagement in general. The consequence is more granular data about how people respond emotionally and therefore more advertising sales for Facebook. Apart from the extra amount of interesting data for Facebook other consequences of the new “Facebook Reactions” need to be discussed. According to Pachal (2015) for brands, sarcastic Reactions will be the new “bashtagging.” Furthermore the use of the “angry” emoticon could lead to problems as well. 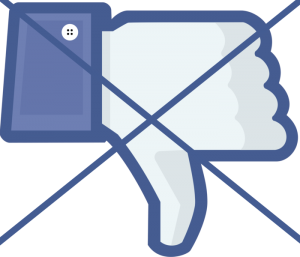 In my opinion it works quite similar as the dislike button and could also lead to negative feedback or even cyber bulling. And where do we draw the line between someone simply being angry and a real “threat”? Site admins can delete racist or extreme comments but they cannot delete inappropriate reactions. Just imagine people responding to an article about people dying while crossing the Mediterranean Sea with the “happy” smiley. According to Adam Mosseri, Facebook’s director of product, giving users the option to turn off the new “Facebook Reactions” was something they considered but then decided against it, explaining that “if you think about the user experience first, that option could become confusing, with people thinking something was broken instead” (Lunden 2015). To establish the new “Facebook Reactions” feature and thus giving the user more possibilities to react was necessary for Facebook but maybe not the perfect solution. On Facebook it is usually all about engagement – not just corporates but also private persons seek for attention (Pachal 2015) and even though users being lazy and looking for simple solutions it is basically impossible to really express emotions with only one click. Even though the “Facebook Reactions” are designed to express empathy with bad news, the “sad” emoji will always just be a ridiculous yellow-faced smiley with a tear running down his face. The question remains if that is an appropriate way to react on bad news like an article about 700 refugees drowning on their way to Europe? I find these smiles irritating. Here they describe how they designed them. It seems they did not think for too long.